This Black Saddlebags dragonfly (Tramea lacerata) chose a beautiful perch and posed briefly for a couple of autumn portraits on Friday at Occoquan Bay National Wildlife Refuge. 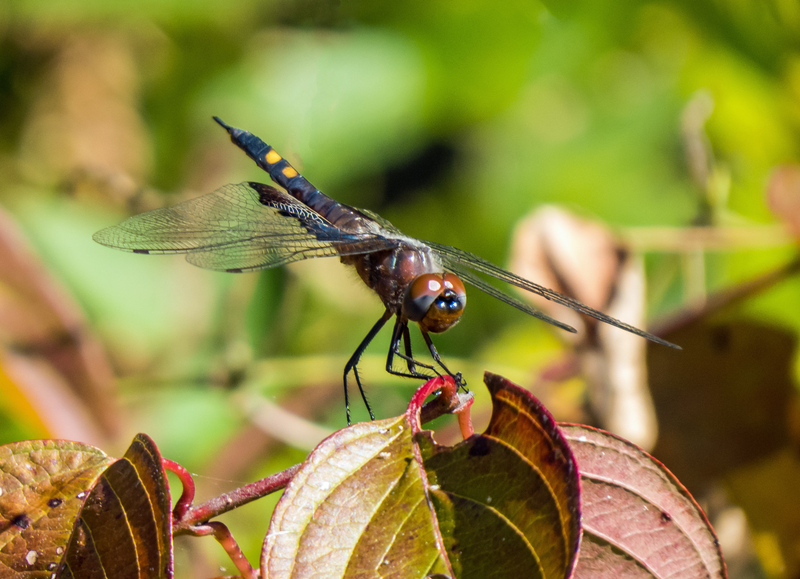 Black Saddlebags usually spend a lot of time soaring high in the air, so it is a special joy for me when one lands and I am able to get some decent shots. I have never before managed to get a good look at their eyes and absolutely love the two-toned color combination. I am becoming convinced that dragonflies are rulebreakers. Yesterday I noted that dragonflies do not always follow the rules and can sometimes be found in habitats where they are not supposed to be. Apparently they also do not know how to follow a calendar and can sometimes be found earlier or later than the rules and records indicate they will be present. 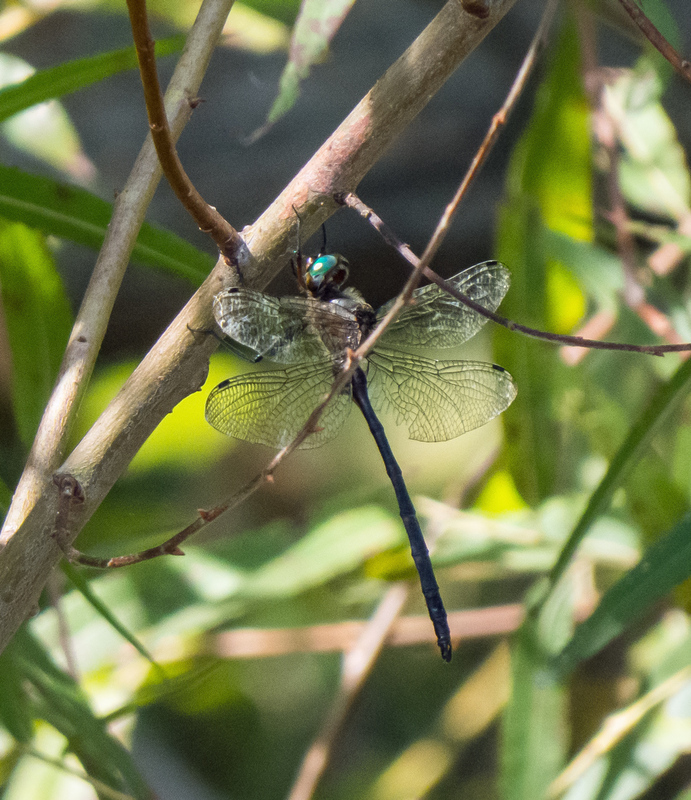 This past Monday I was back at Occoquan Bay National Wildlife Refuge, searching again for the rare Fine-lined Emerald dragonflies that I had seen there previously. When I saw a dragonfly with bright green eyes perch in a distant tree, I naturally assumed that it was a Fine-lined Emerald. 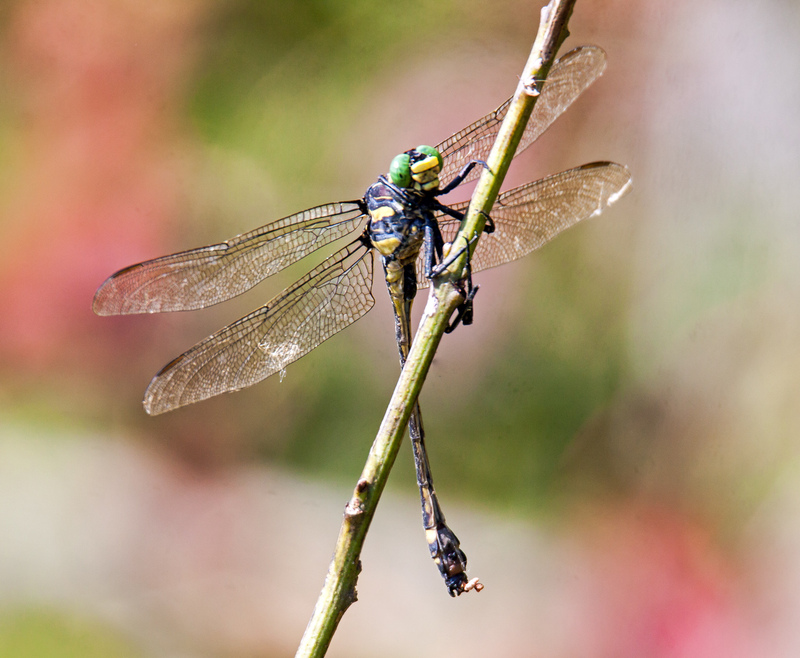 It is getting to be late in the dragonfly season, so many other species are no longer present. The dragonfly never got any closer, so I had to be content with my long-distance shots. When I pulled up the images on my computer, something didn’t look quite right. The shape of the body seemed a little different from the Fine-lined Emeralds that I had seen previously and the tips of the abdomen (the “terminal appendages”) also looked different. I consulted with some dragonfly experts and they identified the dragonfly to me as a Mocha Emerald dragonfly (Somatochlora linearis). I have seen this species before, but in a totally different environment and much earlier in the year, so I had mentally removed it from consideration. Now I don’t feel too bad about missing the identification, because the two species are part of the same genus Somatochlora, also known as Striped Emeralds. The website Dragonflies of Northern Virginia indicates that the flight records for the Mocha Emerald are from 16 June to 16 September—I guess that window can now be extended a little. I am including two photos of the Mocha Emerald that may look almost identical, but were shot with two very different cameras. The settings for the cameras were almost the same with an aperture of f/7.1 and a shutter speed of around 1/400 of a second and both were handheld. The first shot was with my Canon 50D DSLR and Tamron 150-600mm lens. Taking into account the crop factor of the camera, the field of view was equivalent to 960mm. The second shot was with my Canon SX50 with a field of view that was equivalent to 1200mm. The DSLR was a lot heavier and a lot more expensive, but produced a more out-of-focus background. The Canon SX50 was cheaper, lighter, and brought me in closer to the subject. It’s clear to me that equipment did not make a huge difference in this case and that there are advantages and disadvantages to each system. I am increasingly drawn to the idea of carrying both with me for the moment and continuing to experiment with them. The other big lesson that I continue to learn is to expect the unexpected. As I am discovering, subjects may pop up in places and at times when you least expect them. 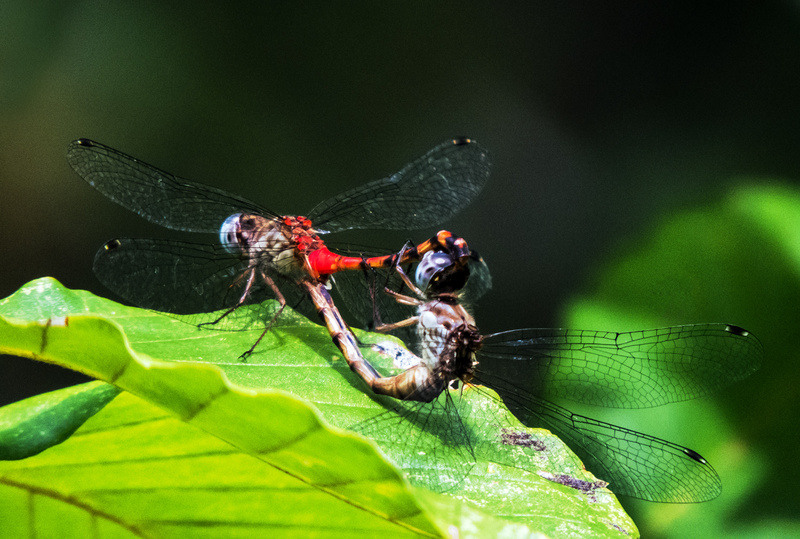 Readers of this blog have seen multiple shots of mating dragonflies, but this was a really special encounter for me. Why? 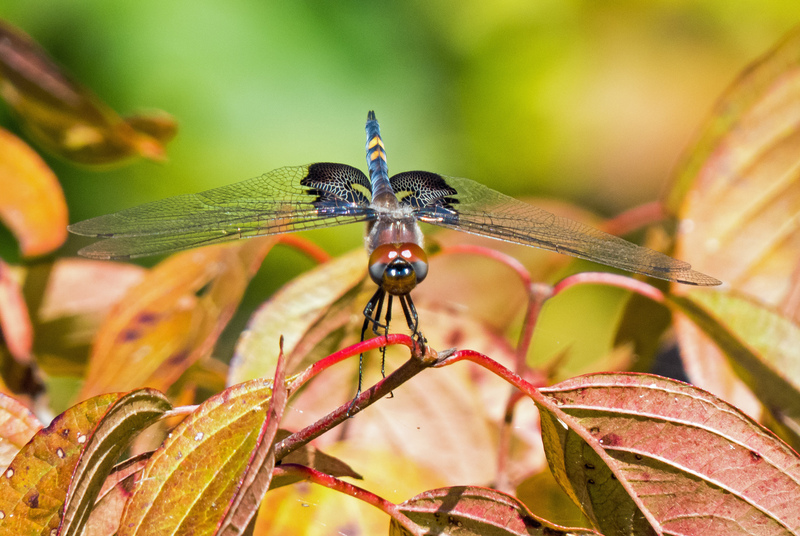 This species of dragonflies is pretty rare, both locally and nationally. As Kevin Munroe described it on his wonderful Dragonflies of Northern Virginia website, “One of Northern Virginia’s most rare dragonflies, possibly our rarest, this species is seldom seen and little known throughout its range, from New Jersey to Florida, and west to Kentucky and Texas. Most field guides describe its breeding habitat as “unknown”.” It is reassuring to see this species breeding in our area, so there is a chance I will see them again next year and in the future. 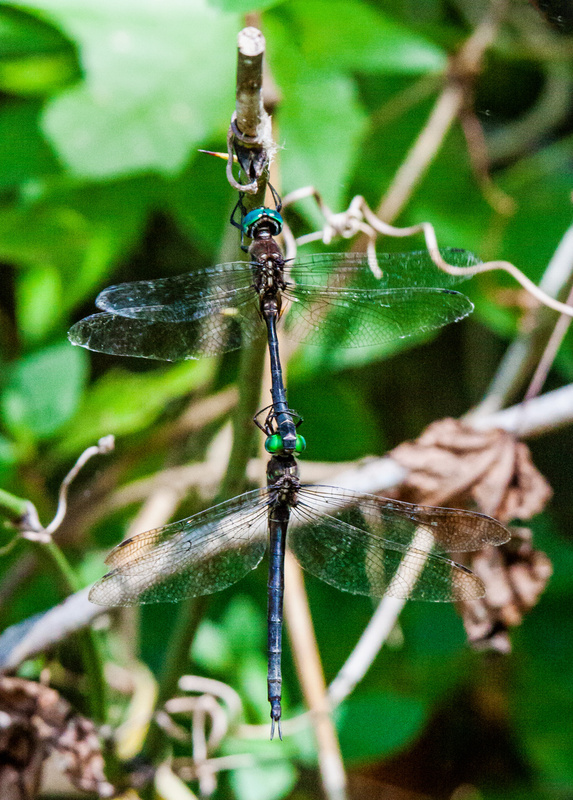 In the section of his website dealing with the Fine-lined Emerald, Kevin included a photo from 2012 of a pair of these dragonflies mating with a caption that indicated it was “the only record of this species breeding in N VA.” I don’t know if others have captured images of mating Fine-lined Emeralds more recently, but it is cool to realize that I am part of a really small group of folks who have documented this behavior. Early this week I went back to the same area, hoping to find another mating pair, but was unsuccessful. I’d like to be able to learn how and where the females lay their eggs. I was told by one dragonfly expert on a Facebook forum that egg-laying behavior for this species has been observed and documented only once. I tend to think of myself as more of an artist than a scientist. I am, however, motivated by an almost overwhelming sense of curiosity that pushes me outdoors more and more frequently with my camera, striving and hoping to capture more interesting subjects and situations that I can share with others. Who knows, maybe I will be able to find out where female Fine-lined Emeralds hang out and deposit their eggs. For several years I have been on a quest, seeking to find a dragonhunter. No, I have not been playing a medieval role-playing game—I have been searching in vain for one of the monsters of the dragonfly world, the Dragonhunter (Hagenius brevistylus). 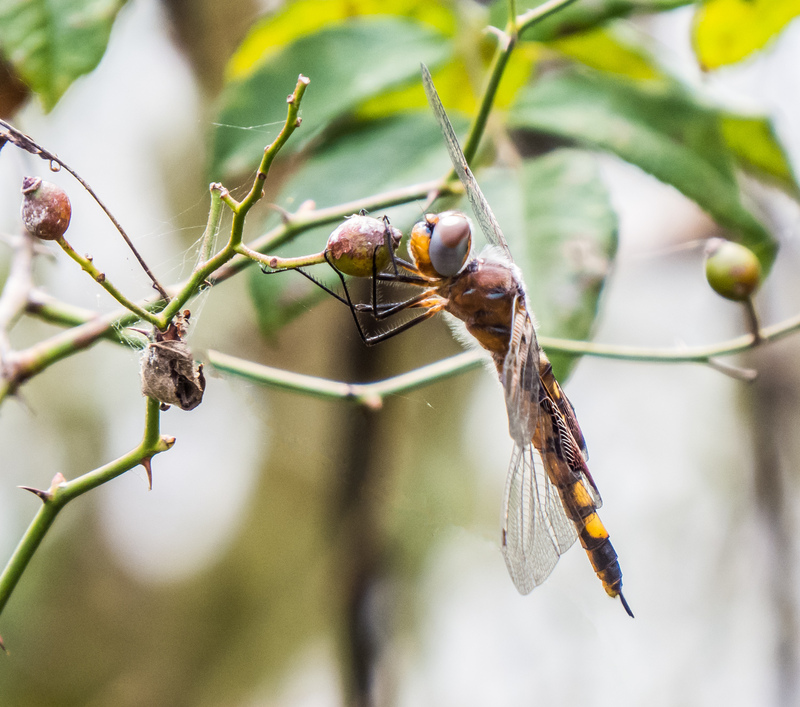 As its name suggests, this fierce predator feeds on other insects, including darner and other clubtail dragonflies, sometimes ambushing them from above, according to Wikipedia. 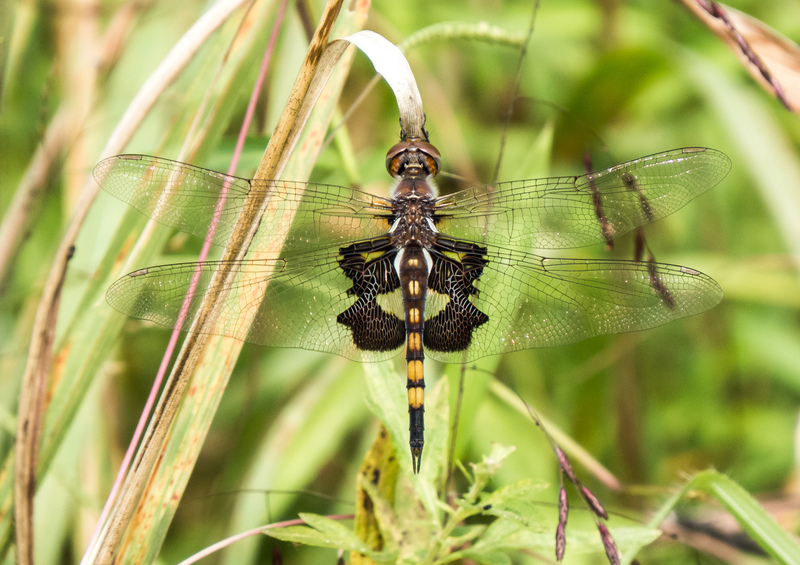 As I was walking yesterday along one of the trails at Occoquan Bay National Wildlife Refuge, I was certainly not expecting to see a dragonhunter. Most of the time they perch in trees overhanging streams and wait for a prey to fly by. 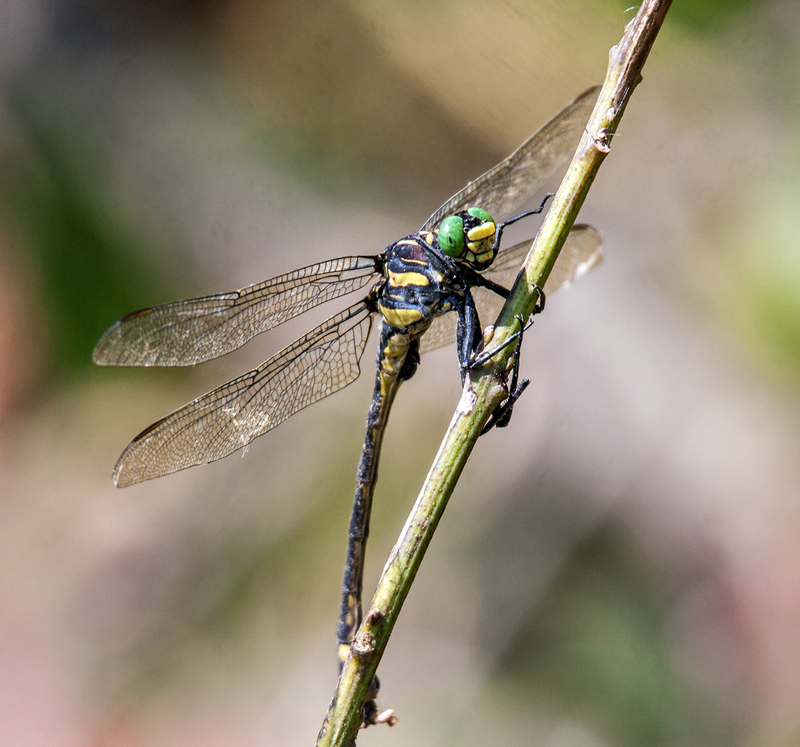 So when I saw a dragonfly perch vertically on the stem of a plant, I assumed that it was a Fine-lined Emerald or possibly a Russet-tipped Clubtail, species that I had previously encountered near this location. When I zoomed in, I noticed that the coloration was different, but thought perhaps that it was a merely female of one of these two species. When I reviewed a couple of shots on the back of the camera and saw the bright yellow stripes on the thorax, I knew that I had captured images of a different species. I wasn’t sure what it was, but local dragonfly expert and fellow blogger Walter Sanford identified it for me as a male Dragonhunter. 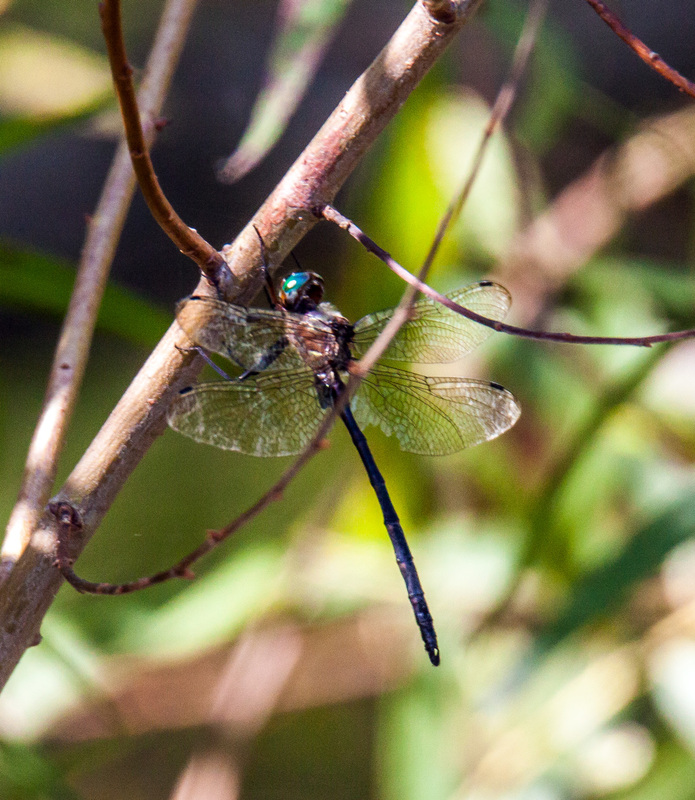 This experience reminded me of one of the lessons that Walter has taught me over the years—it pays to be alert at all times, because dragonflies don’t always follow the “rules” when it comes to habitats and can sometimes be found in locations where you would never expect to find them. It is often said that springtime is a time for love, but so apparently is autumn, especially if you are a Blue-faced Meadowhawk dragonfly (Sympetrum ambiguum). This species appears most often during the latter part of the summer and in early autumn, so springtime is not really an option for them. 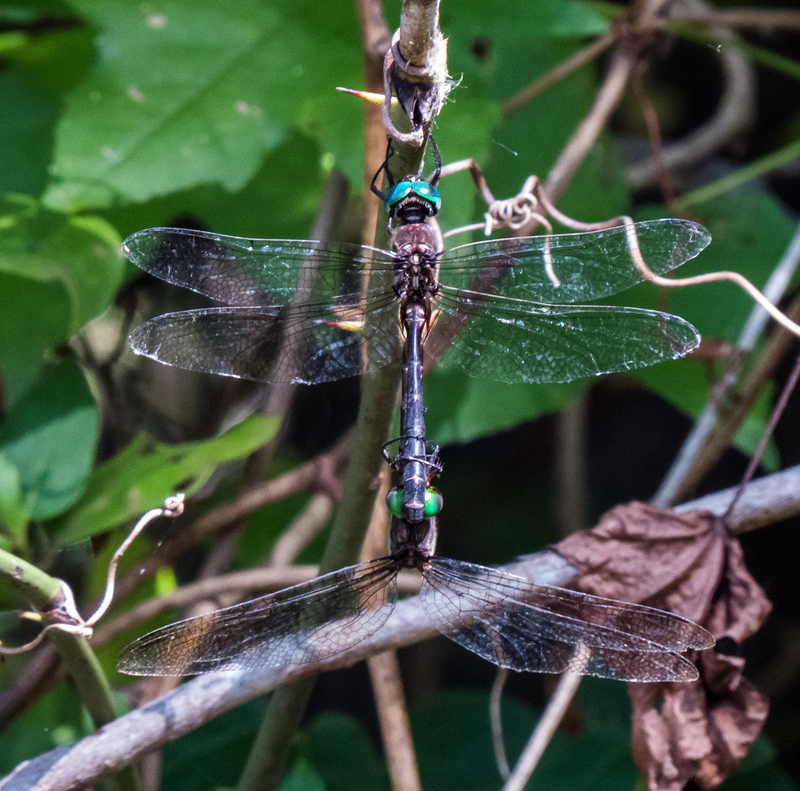 I spotted this couple in flagrante delicto during a recent trip to Huntley Meadows Park. It is hard to get a real sense of scale from this photo, so you will have to trust me that these brightly-colored dragonflies are really small, about an inch and a half in length (38 mm). 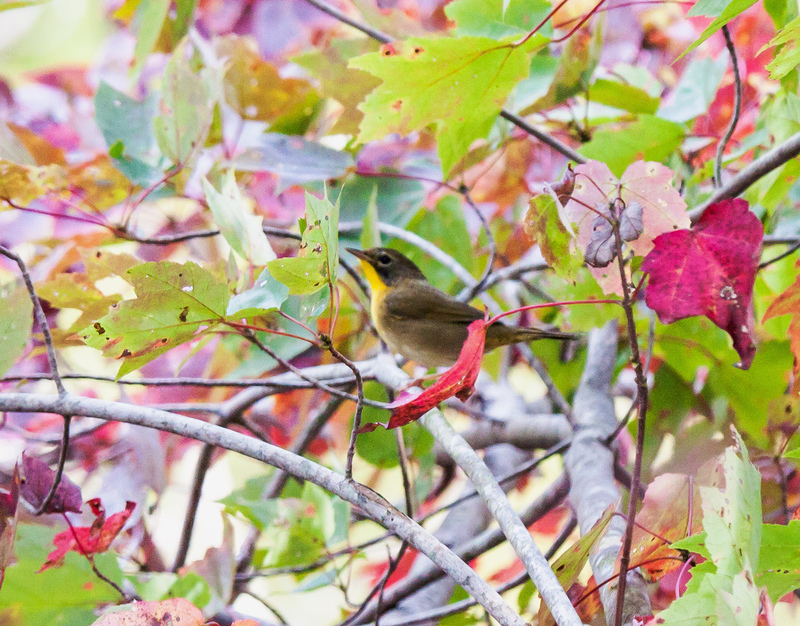 The red leaves surrounding this Common Yellowthroat (Geothlypis trichas) that I spotted in a distant tree recently at Jackson Miles Abbot Wetland Refuge serve as a reminder that the autumn has begun. Leaves are starting to fall from many of the trees and some of them are starting to change colors, though the colors never seen so bright and vibrant as the trees in my native New England. Initially I was not going to post this photo, because I was not able to get a detailed shot of the bird, but the more I look at the image, the more I like the environmental surroundings of the beautiful little bird. Black Saddlebags dragonflies (Tramea lacerata) spend most of their time flying, so it was a rare treat to spot this beautiful female perching recently at Occoquan Bay National Wildlife Refuge. In the second image you can see the distinctive blotches on the dragonfly’s wings that make it look like it is wearing saddlebags, but the first image is my overwhelming favorite—the unique pose, the delicate coloration of the eyes, and the “artsy” overall feel of the first shot produce an emotional reaction in me than the more clinical second shot. Do you prefer one image more than the other?